Having blood drawn or an IV port inserted is, for some, the most painful part of a checkup or hospital stay. A patient’s hard-to-find veins can thwart even the most experienced phlebotomist, and too much poking and prodding can cause nerve damage or infection. To solve the problem, Memphis biotech company Luminetx has developed the VeinViewer, which beams harmless near-infrared rays that are absorbed by hemoglobin in the blood but reflected by surrounding tissue. 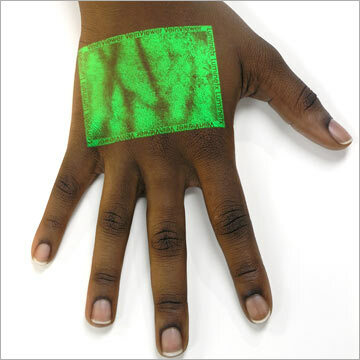 A digital video camera in the VeinViewer captures this information, then its imaging system enhances and projects a small rectangle of light back onto the skin’s surface. The result is a virtual map of a patient’s vasculature. Each person’s “map” is unique, a fact that Luminetx subsidiary Snowflake Technologies is using to develop biometric applications for the VeinViewer. One day, perhaps we’ll stick our hands under the device’s green light not only at the doctor’s office but also at the office or airport.